Ten recipients have been named in phase 2 of the federal Race to the Top grant program, with five states taking home $400 million or more. In the wake of the announcement, the United States Department of Education said it will convene a series of meetings beginning in November designed to bring states together to discuss "promising" ideas. 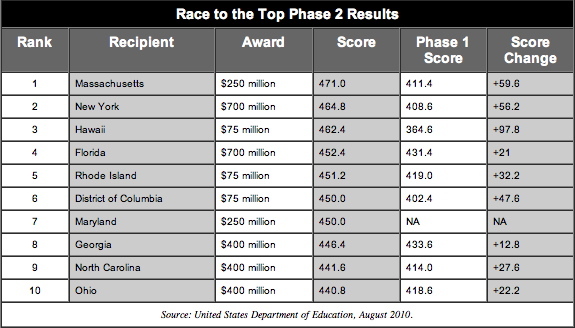 Race to the Top is a $4.35 billion federal program focused on driving changes in public schooling through competitive grants to states that submit "blueprints for reform" to the federal government with an eye toward reforming standards, adopting performance pay for teachers, improving achievement in schools whose students have performed poorly on standardized tests, and developing education data systems. Only two states were named as winners in the first phase of the competition, leaving more than 78 percent of the total grant pool to be distributed in phase 2. Nine states and the District of Columbia received $3.325 billion total this time around, with the top-5 recipients accounting for more than three-quarters of the total awards in phase 2. Winners included: District of Columbia, Florida, Georgia, Hawaii, Maryland, Massachusetts, New York, North Carolina, Ohio, and Rhode Island. "These states show what is possible when adults come together to do the right thing for children," said Arne Duncan, secretary of education, in a statement released to the press today. "Every state that applied showed a tremendous amount of leadership and a bold commitment to education reform. The creativity and innovation in each of these applications is breathtaking. We set a high bar and these states met the challenge." The Obama administration has requested an additional $1.35 billion for Race to the Top in its fiscal year 2011 budget proposal to fund a potential phase 3 of Race to the Top. "We had many more competitive applications than money to fund them in this round," Duncan said. "We're very hopeful there will be a Phase 3 of Race to the Top and have requested $1.35 billion dollars in next year's budget. In the meantime, we will partner with each and every state that applied to help them find ways to carry out the bold reforms they've proposed in their applications." According to a letter sent to governors of the winning states, ED will host a series of meetings beginning in November "for all states to learn from each other and bring promising ideas back to their own states." Further details were not available at press time, though Duncan indicated that the department would update states about the meetings "in the near future." Further information about Phase 2 recipients, including their applications and comments from peer reviewers, can be found on ED's site here.